No logo, no problem! 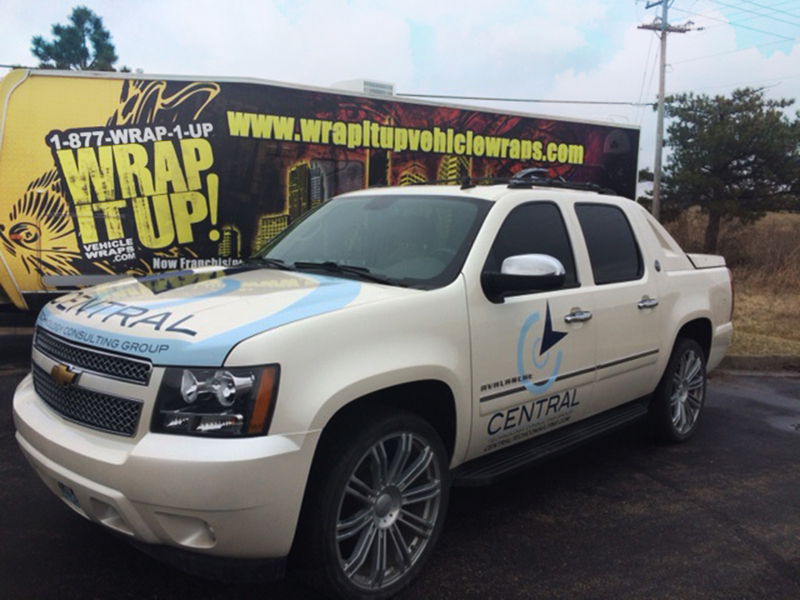 At Wrap It Up we are a complete full service facility. We design, print, and install all in house, and as a result you get a more comprehensive premium product. With this project for House Max our design team was able to give them a complete brand makeover. Our team is well trained in working with you to help you find out what works best for your business. House Max is one of Kansas City’s leaders in home buying. If you are holding on to a house or property that you are looking to get rid of make sure you give our good friends at House Max a call. Thanks House Max! Heads up! At RJM Roofing they believe there is nothing more important than having a good roof over your head. 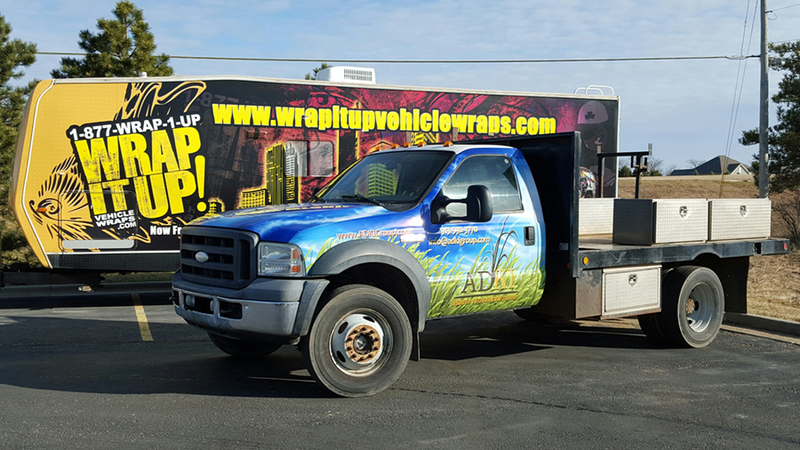 At Wrap it up we believe there is nothing more important than having a wrap on your vehicle. This truck wrap for RJM is top notch. It has some amazing bold graphics with the detailed clouds and the luxurious house that showcases the amazing roof job. The bold yellow and red is used sparingly to really drive home and highlight the important information. This band wrap is well designed and meticulously installed on this beefy Dodge. Kansas City make sure you give our friends at RJM Roofing a call for all your roofing needs. Thanks RJM! Nothing trashy about that! Look at these stunning trash trucks for 4 State Sanitation. These die-cuts fit the space perfectly and popped against that new white paint. If you are in the Fort Scott area make sure you give our friends at 4 State Sanitation a call so they can clean you up. Thanks 4 State! Check out this incredible truck wrap we designed and installed for ADKI Group. ADKI has been providing professional landscaping services in the Kansas City area since 1996. With this partial wrap we emphasized the beautiful deep blue skies, the tall waving green grass, and an amazing logo to give ADKI some great advertising on wheels. Make sure you check out ADKI for your landscaping needs. Thanks ADKI! 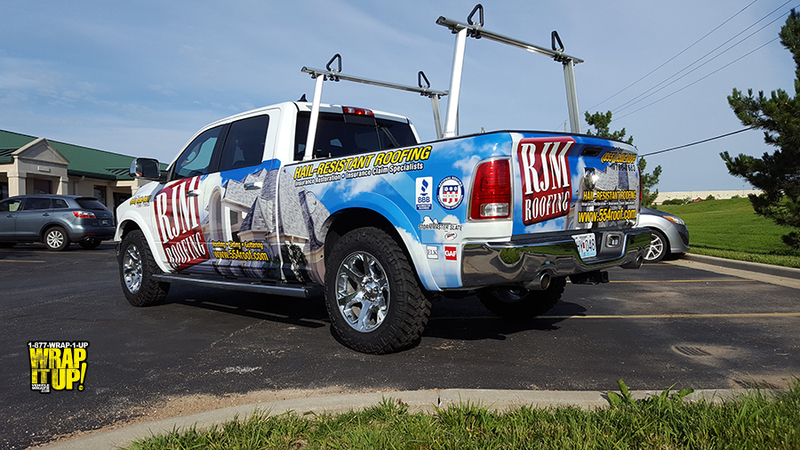 Sure, you could get your work done with a plain white work truck, but why not increase your sales and expand your brand with an eye-catching vehicle wrap. 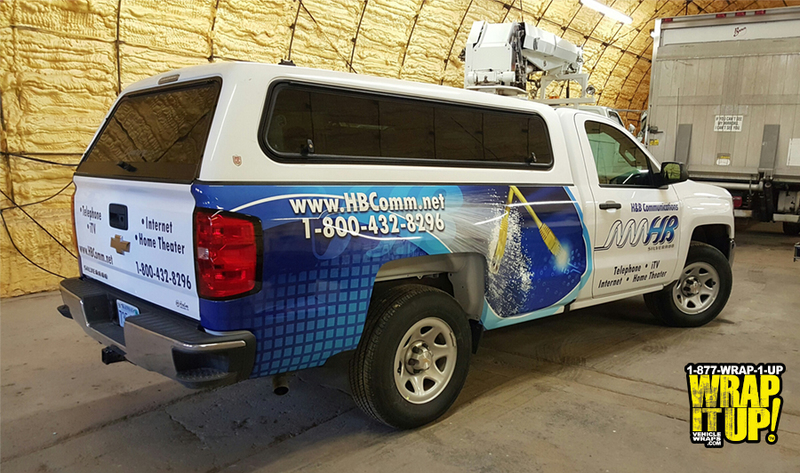 It was a pleasure installing another truck wrap for H&B Communications. With H&B you get fast internet service that keeps pace with your busy life. Visit H&B for your communication needs. 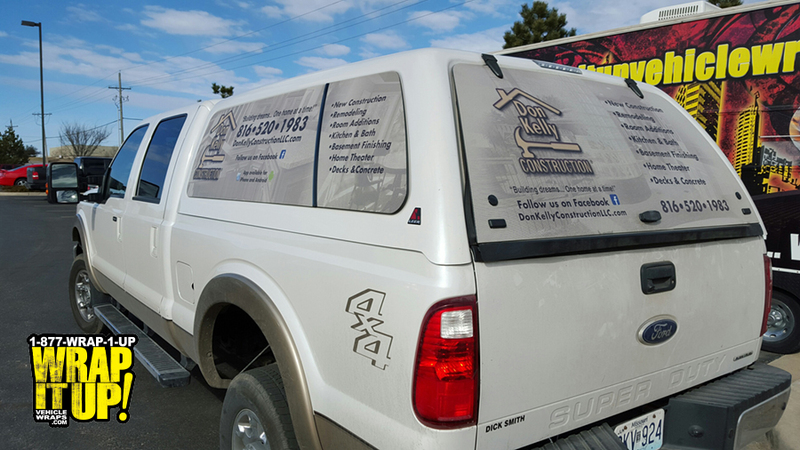 Window perforations are a solution when you are not quite ready for a complete vehicle wrap. We would always encourage going all out when it comes to branding and trying to increase your sales especially here in Kansas City. However There are just some times when the current situation is not right for that commitment, whether it be vehicle condition, finances, or lack of a brand or concept. A window perforation is a great solution to gain revenue and awareness for you company or organization. We have done full wraps for Don Kelly before, but this time they just wanted to do the rear windows of this topper, and it turned out amazing. Thank Don Kelly Construction! You never would have thought that this 2015 Chevy was once Silver. 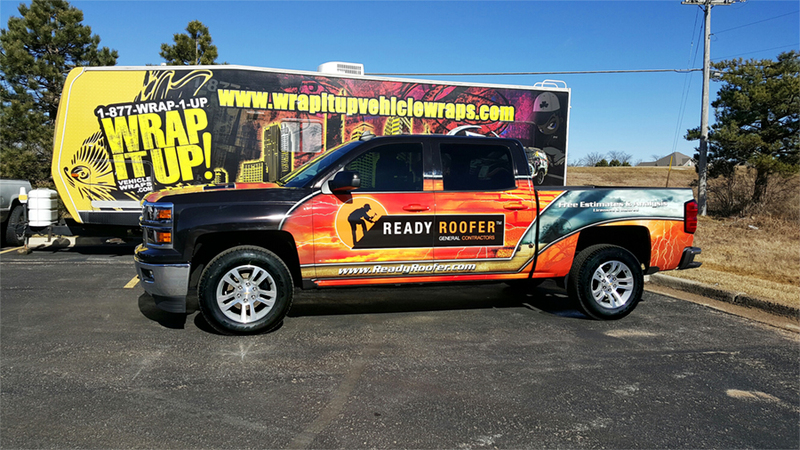 We have wrapped several truck wraps for Ready Roofer and they always turn out spectacular. Ready Roofer is the Midwest’s leader in storm damage repair. Thanks again Ready Roofer! 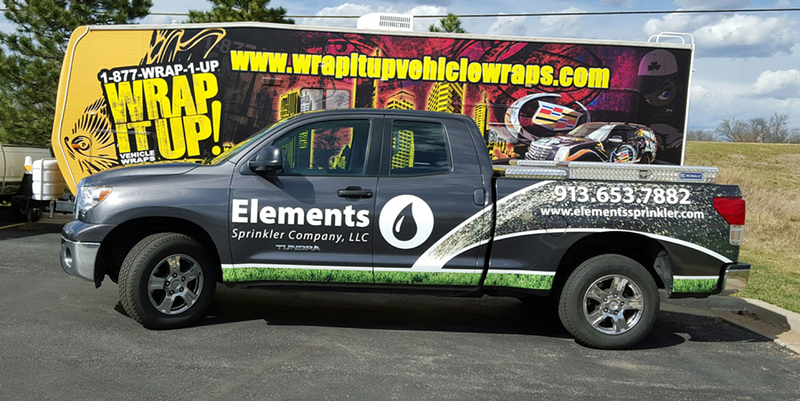 Keep an eye out in the Kansas City area for this new FCR Truck Wrap. 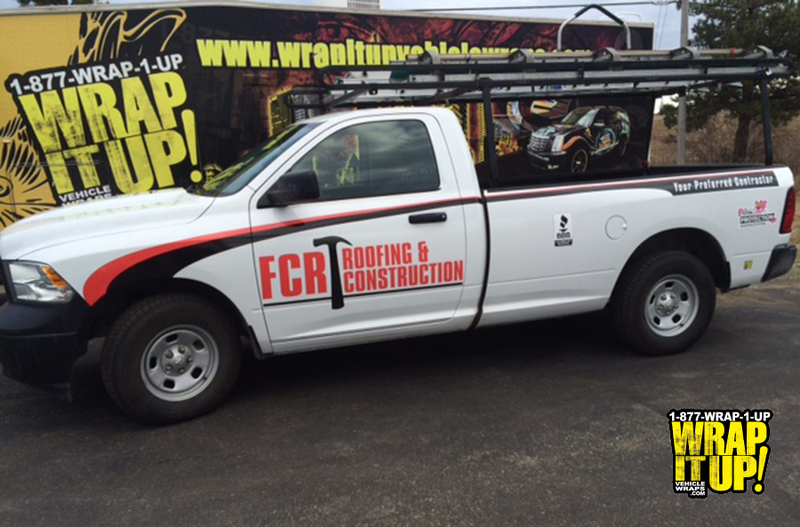 We have wrapped several FCR vehicles, and we are proud to display this clean design. FCR Roofing and Construction is a leader in roofing and construction in the Overland Park community. This die cut and tailgate wrap look brilliant on this Chevy Avalanche for Central Tech out of Kansas City. Simplicity plus an awesome truck and a cool logo equals Wrap It Up success.